The introduction of the horse by the Europeans led to a period in history of the Great Plains Indian history called the Indian Horse Culture. The horse was introduced to the North American continent in the 1500's. To the Native American Indians, who lived the life of a Stone Age man, the horse and its use by men, was a wonder to behold. It was at first referred to by the Native American Indians as the “Big Dog” or “God Dog”. The horse and rider team were seen as a godlike being. To retain this illusion for some years it was made illegal for a Native Indian to ride or own a horse. However, the Native American Indians soon acquired horses and this gave rise to the Indian Horse Culture. The Indian horse was often decorated in Horse War Paint in preparation for battle, as can be seen in these pictures. It is generally agreed that the horse was introduced to the North American continent by the Spanish in the 1500's. The horse was indispensable to the conquest of Mexico by the Spanish conquistador, Hernan Cortez (1485 – 1547). The horses brought from Spain were a mixture of Barb, Arabian and Andalusian breeds. The qualities of these horses, which became the American Indian Horse breed - the Mustang, were perfect for riding the great Plains and hunting buffalo. Prior to the arrival of the Europeans, and the horse, the Native American Indians were extremely limited in their ability to travel. They travelled on foot. Their only domesticated animals were their dogs which were sometimes used to haul an Indian's belongings on a travois, which was similar to a sled. The introduction of the horse transformed the Native American Indians into nomadic hunters and warriors - the Indian Horse Culture was born. At first it was difficult for an Indian to acquire a horse - horse stealing and horse raids were the first option. Horse stealing was seen as honorable by the Indians. A horse was of great value and the number of horses owned by an Indian gave him great prestige. The successful Pueblo Rebellion of 1680 forced the Spanish out of New Mexico and many of their horses were left behind. Famous tribes such as the Ute, Comanche, Kiowa, Apache, and other tribes in the area took full advantage of these horses. Horse trading became popular and the horses from the Southern regions soon started to spread to the North. By the 1700's the Pawnee, Cheyenne, Sioux. Crow, Shoshone, Mandan, Flathead, Nez Perce and Cree tribes had all acquired the horse and had become highly skilled horsemen. Native American Indians began to move or migrate onto the Great Plains, fully embracing the hunter-gatherer life style. The adoption of the Indian Horse Culture was an obvious progression for the Native American Indians. 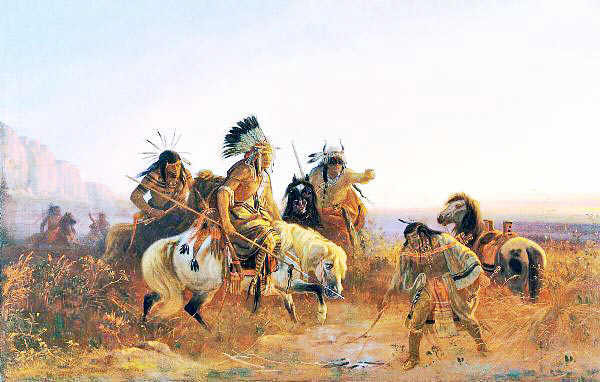 Their ability to hunt prior to the introduction of the horse was dependent on their ability to kill buffalo on foot. A dangerous and difficult task which they made easier by stampeding herds of buffalo and driving them off the edges of cliffs and drive the herd into a corral. Steep cliffs, with a corral or enclosure at the bottom, was called a piskun and was used by American Indians for driving large numbers of buffalo to their slaughter. The horse gave them the ability to hunt buffalo on horseback and adopt an efficient and lucrative hunter gatherer lifestyle. The Buffalo Horse was trained to hunt bison. The Indians who rode these horses were called the Buffalo riders and were great horsemen. The Buffalo riders hunted with bows and arrows, they were able to aim twenty arrows in less time it would take to load a muzzle gun. Guns were not used for hunting buffalo until the 1870's when breechloaders became available. The buffalo horses were so highly valued that they were always kept near to the owner and tethered just outside their tepees or even inside their lodges. By the 1800's the Indian Horse Culture rose to its highest levels. It brought about a change in class system. An individual Indian, not the tribe, owned the horses. This produced a new class system for Native American Indians which was based on the ownership of horses. Young Indian braves proved their prowess by acquiring a horse. A horse brought wealth to an individual Indian as well as bringing power and prestige. Excess horses were traded for goods or loaned to other members of the tribe. The ownership of horses also gave the Native American the ability to barter for additional wives. The herds of horses within a tribe could be increased by acquisitions from war parties, breeding and by trade. The Indian Horse culture brought about these changes in their culture, but it lasted less than 100 years. The Indian Horse Culture had lasted for just under three hundred years - by 1900 it had disappeared.